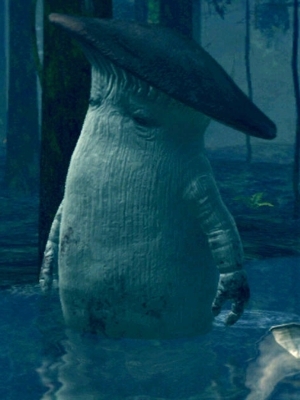 A giant anthropomorphic mushroom with bloodstained fists. Has an incredibly powerful punch that is not to be underestimated. Two can be found at the area between Alvina's building and the stone bridge leading to Sif's arena, guarding the Enchanted Ember. Some Mushroom Children can be found running around the area. 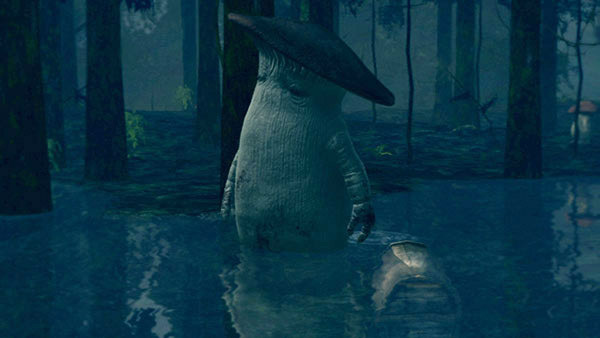 Three at the bottom of the great hollow archtree, with the giant mushroom platforms, near the entrance to Ash Lake, accompanied by several Mushroom Children; One can be found at a hollow archtree in the Ash Lake, accompanied by some Basilisks. Despite their looks, these creatures are very powerful; one successful punch can be a one shot kill for many low level players and even some high level. They are not very armored, but their HP is very high. Also note that they usually travel in packs except for one in Ash Lake. Don't be fooled by their stubby arms, all of their attacks cause them to lurch far forward, especially if they are on a down slope. Melee characters should be careful while strafing around them to the left, as their rotation animation looks almost exactly like their wind-up before punching. Try to stay away, until they leave themselves open after an attack. They are also very easy to outrun. If your Soul Level is fairly low, fleeing is suggested. In the Darkroot Garden, they can get stuck easily as they try to pass in between trees. You can use this to your advantage to kill them with a bow and arrows, or seeing as the range of their attacks is very small, you can attack it with a spear without being hit. In the Great Hollow, they can get stuck easily if you lure them up as they are bigger than the player character for which the paths were designed. Also in the Great Hollow, if you enter from the Ash Lake side and try to lure them out, they will walk back right after the turning of the tunnel, this makes them easy prey for an archer.